Come the middle of winter we become a two pans of porridge in the morning household. The traditionalist – don’t mess with my breakfast – Ed likes a classic creamy oat and milk based porridge, whilst I am more adventurous about breakfast and start to look for some more interesting options. 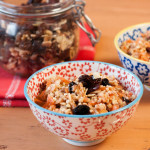 My latest, and currently favourite porridge contains buckwheat and a mix of flaked oats, wheat, spelt and rye, spiced with cloves and cardamom, with added dried fruit, seeds & nuts, as well as a grated carrot for that all important portion of Extra Veg at breakfast time! A generous dollop of coconut oil moistens and adds flavour. This is full of texture and far more interesting than your usual bowl of porridge. This would be delicious served with a spoon of my carrot jam. Nuts – raw cashews, almonds, walnuts, cob & hazelnuts. Fruit – unsulphured apricots (makes such a difference to taste), dates, figs, cranberries, raisins, currants, sultanas etc. If you try this Spiced Buckwheat & Oat Porridge with Coconut & Carrot please tag #FussFreeFlavours on Instagram or Twitter. It is amazing for me when for me when you make one of my recipes and I really do love to see them. You can also share it on my Facebook page. Please pin this recipe to Pinterest too! Thanks for reading Fuss Free Flavours! 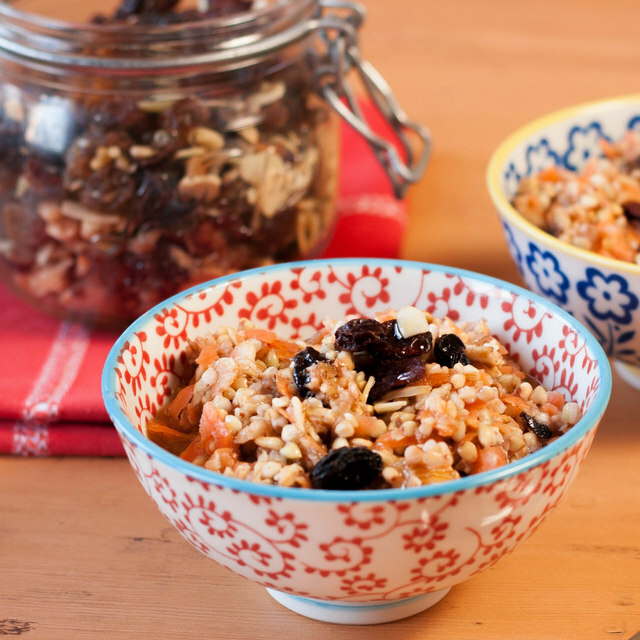 Place the buckwheat and oats into a bowl, cover with cold water and allow to soak overnight. In the morning drain the buckwheat and oats, put in a pan with the rest of the ingredients along with an espresso cup of water. Cook over a gentle heat for about 10 mins until the coconut oil has melted and the buckwheat is soft. Serve immediately with a drizzle of maple syrup.